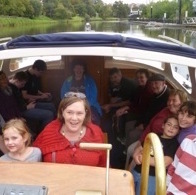 We celebrate Resurrection Morning (Easter Sunday) by enjoying a leisurely boat cruise along the Yarra River from Federation Square to Herring Island. On the Island we take advantage of some of the wonderful sculptures in the sculpture park to observe a short stational liturgy focussed around the stories of the resurrection of Jesus. The liturgy concludes with sharing a barbecue breakfast (BYO food and drink) in the picnic area (free public barbecue facilities available). The boat collects us in time to return us to Federation Square by 1:30pm. It is also possible to skip the cruise and join us at the island by meeting us at the Como Landing, on the South Yarra side of the river, right where Alexandra Avenue meets Williams Road in South Yarra to be ferried across.